True Story: Books for Sale! Hi! I have self-published a comic book a year since 2012, and I give them as Christmas gifts so they're published at the end of the year. Each book contains about 20 pages of comics from that year, each page containing one to four comics. 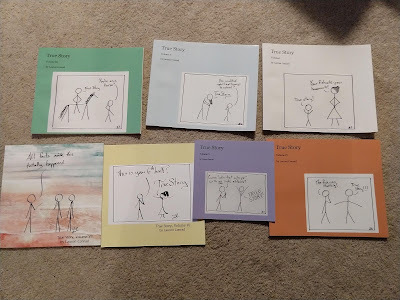 If you are interested in any of my books, they are about $25 each. The first few are not in print anymore, so they might be more since I would need to re-create them.